The people of Chaco Canyon built things that look like roads that radiate outward from the canyon. When high resolution satellite photographs became readily available to archaeologists in the late 20th century, they noticed lines in the terrain, radiating outward from Chaco Canyon. Using the photos, the archaeologists went on site to determine the source of the lines. Some of the lines were very visible cuts in the soil and stone. Others were not readily apparent at ground level, but apparently reflected light waves sufficiently different from surrounding terrain to be visible on satellite telemetry. Native Americans built roads? Yes, in our previous articles on the advanced indigenous culture around Lake Okeechobee, FL we discussed the extensive system of roads, canals and causeways that connected the Atlantic and Gulf coasts of southern Florida. The native peoples of Southern Florida seem to have been influenced by the Maya civilization, and problem absorbed Maya commoner immigrants. Archaeologists currently do not know of any western Native American cultures who built roads, other than Chaco Canyon. However, Chaco is almost 3000 miles of the Yucatan Peninsula. It is highly unlikely that Maya visitors influenced the Basketmaker Culture people in Chaco Canyon to build roads as part of their leap toward civilization. Mexican cultures improved old trails into roads, but these were typically curvilinear except when causeways crossed lakes and wetlands. In contrast, the Anasazi People labored to push roads straight through stone or earthen barriers. There is controversy, though, among archaeologists as to whether the Anasazi roads are really roads. Some theorize that these were sacred ways used for ceremonial processions, but were only traveled intermittently by commoners. Other archaeologists theorize that since the straight lines usually interconnect known settlements, they obviously were heavily used roads. (See the map above.) Other archaeologists feel that the roadways had both ceremonial and practical functions. Whatever the case, the Anasazi “roads” required extensive human labor. Why would the Anasazi invest so much human energy into these public works projects, when there was no tradition for building roads, and none of their neighbors ever built roads? The answer to this question points southward, just like in an early article on the architecture of Chaco Canyon. Outside the Maya World, there was no strong Mesoamerican tradition of building straight, radial roads. However, in the Andean cultures, there was such a tradition. Road building may have begun in some areas of Peru over 2000 years ago. The cultures that occupied the Andean Region between 0 AD - 800 AD definitely built roads. The Incas continued this tradition and expanded the road network in all directions. 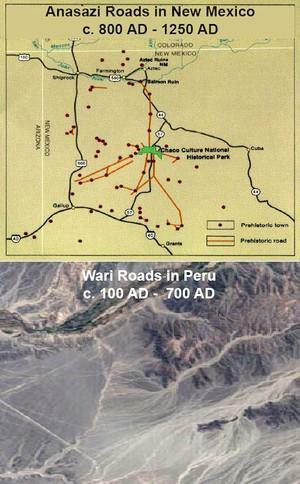 The Peruvian culture that built roads most similar to those of the Anasazi was the Nasca. The Nasca occupied the arid coastal plain and Andean foothills of Peru. They are best known for their abstract effigy figures and geometric forms etched into the desert terrain. However, the Nasca also built true roads that radiated outward from major towns and interconnected villages. The Nasca Culture collapsed about half a century before pottery and a new style of architecture appeared in Chaco Canyon. The Nasca also practice human sacrifice as did the elite of the Anasazi. Archaeologists currently believe that Nasca roads performed both practical and ceremonial functions. Some Nasca roads interconnect towns, while others suddenly stop at the ruins of ancient shrines. The shrines contain offerings to various gods or goddesses, and sometimes, the skeletal remains of human sacrifices. It should be emphasized that the possible link between the Nasca Culture and Anasazi is purely a postulation by the writer. Apparently, no archaeologist has carried out the forensic studies necessary to transform a postulation into an archaeological fact. However, the presence of third generation Nasca immigrants in Chaco Canyon would answer many of the puzzles that now confront archaeologists. Absolute proof of a South American-Southwest cultural connection may be difficult. As refugees from the collapsed Wari “Empire” migrated northward along the Pacific Coast, they would have probably intermarried with local ethnic groups and absorbed cultural ideas from these groups. The migration itself could have altered their cultural practices. Thus, the peoples who might have reached Chaco Canyon would have carried a hybrid cultural tradition, not one that was a pure clone of the mother culture. Today, Chaco Canyon is a semi-desert, typical of the Colorado Plateau. It once was a forest. A reader’s comment referred to the Apache tradition that the Anasazi came from the south. He was referring specifically to the Anasazi and not to all Native Americans in the region. The Apache and Navajo both have a tradition that they were once part of one giant Athabaskan Tribe near the Great Slave Lake in semi-arctic Canada. In fact, the Navajo’s call themselves the Dene’ and there is still a Dene tribe near the Great Slave Lake. The Apache tradition of the Anasazi coming from the south could only be a reference to the elite of the Anasazi, who arrived in the region around 850 AD. The Basketmakers were there for at least a thousand years earlier. They preceded the Apache and Navajo by at least 1200 years. However, the Basketmakers, themselves, could have possibly migrated northward out of the Sonoran Desert. These questions have not been fully answered by archaeologists. Why was Chaco Canyon was abandoned? Archeologists now know that when Chaco Canyon was occupied by the Basketmaker III Culture (600-850 AD), it was covered with a forest of mixed oak, piñon, ponderosa pine and juniper trees. The Chaco Canyon Basketmakers were relatively insignificant in population and only grew small gardens. They seemed to have had a minimal impact on their environment. Construction was begun at several of the largest “great houses,” including Pueblo Bonito, during the period, 850 AD – 950 AD. At this time, the region was still forested. However, increasing population levels put commensurate demands on the forests for fuel and building materials. In addition, land was cleared for large scale agriculture. The Chaco Canyon Culture’s influence continued to expand during the next century. However, by this time, the canyon had essentially been deforested. There was increased rainfall around 1040 AD , which temporarily enabled the natural vegetation to start recovery. A second wave of “great houses” with different, more compact architecture was initiated soon thereafter. The third stage of Pueblo Bonito was constructed between 1050-1070 AD. 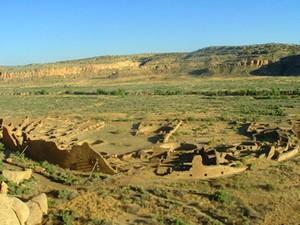 Around the year 1100 AD, the Chaco Canyon Culture was at the peak of its population and influence. At this time, the builders and residents of the canyon were being required to walk many miles to obtain firewood and construction timbers. A drought had begun around 1090 AD in the Colorado Plateau. The population already seemed to have become increasingly stressed due to poor nutrition during the later part of the 10th century. Commoners were much more affected than the elite. This is also the period when archaeologists have found evidence suggesting cannibalism by the elite. Archaeologists are still debating the specific details of Chaco Canyon’s decline, but one fact is clear. The major buildings were carefully sealed up, and the community was then abandoned by 1150 AD. Chaco Canyon was never again occupied by a large human settlement. The landscape became a permanent semi-desert, typical of the Colorado Plateau. The health of the landscape was further damaged by excessive grazing by sheep and cattle during the Colonial and Frontier Eras. Both Native Americans and European Americans were responsible for this last damage. The demise of this brilliant indigenous culture seems to be caused by natural climatic changes, deforestation of the region, over-cultivation of the soil and accumulation of salts in the soil as a result of irrigation. The National Park Service is attempting to establish vegetation typical of the period when Chaco Canyon was in cultural fluorescence, but the effort has been hindered by the permanent damage to soil fertility by its previous occupants and another drought, which is now lowering the water table in the Southwest.